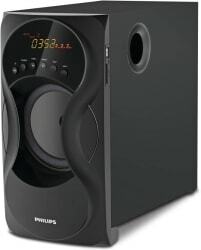 Have been on the lookout for the perfect sound system to accompany your staggering music collection? Or maybe to connect to your PC or even your television set. Well your search has finally come to an end with Philips SPA5160B. With a 65 Watt and a Subwoofer drive you can now enjoy every single genre of your beloved music with optimum sound quality. Moreover, it has connectivity features like USB and FM making it an optimum result of perfect mixture of creativity and intelligence. Buy this at the best price only on Infibeam!